Daley Homes has been helping build beautiful homes and neighborhoods in the San Joaquin Valley for over 40 years. The company was founded in 1971, and has been building quality homes ever since. Daley Homes is able to offer many options and features other builders are not able or willing to do. We allow our buyers to personalize their homes however they want. You have the opportunity to choose from over a dozen floor plans to be placed upon the lot of your choice. Our buyers have the option to move interior and exterior walls, redesign their kitchen and master bathrooms, and choose the colours that they like. This is why so many families choose a Daley Home. Read our customer reviews about Daley Homes. Our mission at Daley Homes is to provide our customers with quality service that they can count on. We do this by putting our clients first and working with them through every step of the process. We have been serving customers in the local San Joaquin Valley for over 40 years and will continue to do so. Our neighborhoods in Visalia, Tulare, Hanford, Lemoore and Corcoran are the best around and unlike most builders, Daley Homes allows buyers to personalize plans to their specifications. Customers can add or delete rooms, increase square footage, add garage space, add covered patios, change electrical, choose interior and exterior finishes, or just tweak an existing floor plan. The choice is yours! 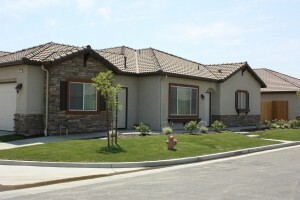 Daley Homes owns attractive rental communities in the San Joaquin Valley area. Daley Enterprises is able to offer competitive rental rates with our signature higher quality.